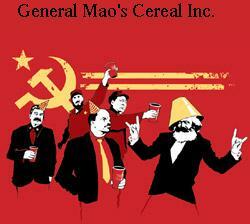 Start your day the Marxist way with Commie-O's™! Wake up slowly? Need the morning to get ready? Have a box of Commie-O's™ to get your morning started! Packed full of vitamins and minerals these delicious whole grain treats will be sure to wake you up right. With their fun shapes kids of all ages can enjoy them. They have: Red Marshmallow stars, Whole grain sickles and hammers, and your favorite Communist leader faces! Invite over some friends and have a Communist Party! Sugar, modified corn starch, Mother Russia, corn syrup, dextrose, cyanide, gelatin, calcium carbonate,Stalin(to keep fresh) yellow 5&6, blue I, red 40, artificial flavor), sugar, corn syrup, corn starch, artificial Lenin flavoring, salt, orphans, calcium carbonate, Red #1, trisodium phosphate, zinc and iron (mineral nutrients), vitamin C (sodium ascorbate),50 pints of fresh virgin blood, a B vitamin (niacinamide), artificial flavor, vitamin B6 (pyridoxine hydrochloride), Kraken blood, Red #2, vitamin B2 (riboflavin), vitamin B1 (thiamine mononitrate), vitamin A (palmitate), a B vitamin (folic acid), vitamin B12, vitamin Я, wheat starch, vitamin E (mixed topopherols) added to keep the People's Party in power preserve freshness. Commie-O's™ may be found at your local grocery store or fine seller of goods. Sold as a product of General Mao's Cereals Inc. Sold for the amount of money that will bring your total amount of cash down to the average amount for the country you live in. WARNING: EVERY COMMIE O IS EXACTLY THE SAME. ALL COMMIE O'S HAVE EQUAL NUTRIENTS, INGREDIENTS, AND WAGES! Copyright 2006: Devin Gauthier Inc. The value of this commodity is based on two things- how hard it is to make it and how useful it is. Quantity is a result of the difficulty to make it; for example, as diamonds are hard to find, there aren't many of them and they are expensive. The wealth of those societies in which the capitalist mode of production prevails, presents itself as "an immense accumulation of Commie-O's," its unit being a single Commie-O. A Commie-O is, in the first place, an object outside us, a thing that by its properties satisfies human wants of some sort or another. The nature of such wants, whether, for instance, they spring from the stomach or from fancy, makes no difference. Neither are we here concerned about how the Commie-O's satisfy these wants, whether directly as means of subsistence, or indirectly as means of production. 1. Abolition of property in Commie-O's and application of all Commie-O's to public purposes. 2. A heavy progressive or graduated income tax of Commie-O's. 3. Abolition of all right of inheritance of Commie-O's. 4. Confiscation of the Commie-O's of all emigrants and rebels. 5. Centralisation of Commie-O's in the hands of the State, by means of a national Commie-O bank with State capital and an exclusive monopoly. 6. Centralisation of the means of communication and Commie-O's in the hands of the State. 7. Extension of Commie-O factories and instruments of production owned by the State; the bringing into cultivation of Commie-O waste-lands, and the improvement of the soil generally in accordance with a common plan. 8. Equal liability of all to labour. Establishment of industrial armies, especially for Commie-O agriculture. 9. Combination of Commie-O agriculture with Commie-O manufacturing industries; gradual abolition of the distinction between town and country, by a more equal distribution of the Commie-O's over the country. 10. Free Commie-O's for all children in public schools. Abolition of children's Commie-O factory labour in its present form. Combination of education with Commie-O industrial production, &c., &c.
This page was last edited on 12 July 2012, at 03:37.